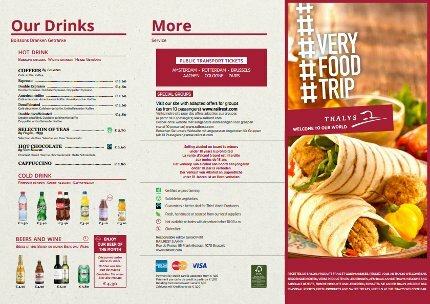 At Thalys Bar you can enjoy our quality range of ultra-fresh sandwiches, delicious snacks and hot and cold drinks throughout your journey. Sweet snacks or fresh fruit... we cater for all tastes at any time of the day. Come and taste the Thalys Bar. In collaboration with Thalys, it is Railrest's aspiration to change and extend the range at the Thalys Bar; a range that is based on what the passenger wants and modern food trends. Are you vegetarian? No worries. At the Thalys Bar you will find products especially for you.